LOUISVILLE, Ky. — Beef cattle buyers spent a record $1,141,175 on 448 lots at the 2014 Kentucky Farm Bureau Beef Expo Feb. 28-March 2 at the Kentucky Exposition Center. 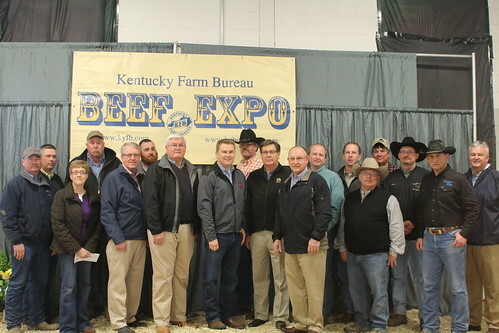 Breed representatives pose with James Comer, Commissioner of Agriculture (center), and the Kentucky Farm Bureau Executive Team. The average of $2,547.27 per head also set a record, the Kentucky Department of Agriculture’s Division of Show and Fair Promotion reported. The total was 5.4 percent higher than that of the 2013 sale, and the average was up 7.9 percent over the previous year. The Beef Expo surpassed $1 million in sales for the third consecutive year. Consignors from 16 states brought animals to the Beef Expo. The sale topper was the grand champion Beefalo bull, consigned by Kyle Skidmore of Shepherdsville, Ky., which fetched a top bid of $9,700. The reserve champion Simmental bull, consigned by Wesner Livestock Enterprises of Chalmers, Ind., sold for $9,500. Two females each brought $8,500: the grand champion Simmental, consigned by Hudson Pines Farm of Sleepy Hollow, N.Y., and the reserve champion Angus, consigned by Buckner & Jeffries of Canmer, Ky. The top-selling pen in the Pen Heifer Sale was the champion commercial spring-bred heifer pen, consigned by DeBord Farms of Somerset, Ky., which sold for $7,500. The Angus sale led the way with an average of $3,761.81 per lot, followed by the Simmental sale at $3,639.44. The Pen Heifer Sale generated sales of $214,225 for 115 lots. Youth exhibitors showed 333 cattle in the Junior Show, including 156 from Kentucky. The judging contest attracted a record 207 participants — 126 senior participants and 81 juniors — including 32 senior teams and 19 junior teams.